The Man Who Walked Between the Towers: "Now the towers are gone." We got into a little bit of bed time story rut recently and I've updated our library books with some new books (some winners and some others that will be making a trip back to the library). 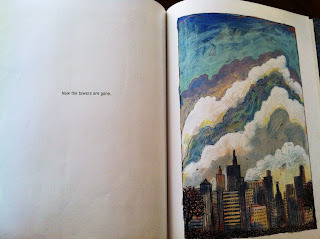 Today I was reading a book to my just-turned-five-year-old daughter called The Man Who Walked Between The Towers by Mordicai Gerstein. 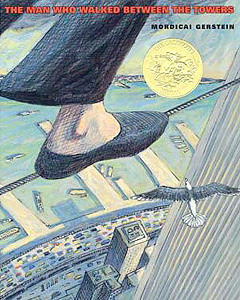 This 2003 award winning children's book is a beautifully illustrated story of Philippe Petit's high wire act he performed between the Twin Towers of The World Trade Center on August 7, 1974. I became familiar with Phillipe Petit's journey is the suspenseful Oscar winning documentary Man on Wire which came out in 2008. The story is remarkable not just for the daring and dangerous tight rope act itself, but for the efforts to break into the tours, and string the wire in the middle of the night. The true story is gold for drama and intrigue. Now the choice to tell the story of Petit in a children's story is a little more unique, particularly since it seems like atypical story material. Yet it's also seems clear that Gerstein was telling to story of Petit as a homage to the World Trade Center and the 9/11 tragedy. And the output is this children's story of man who breaks onto the roof, gets charged for committing criminal acts after performing death-defying acts. Yet when I was reading this to my daughter after all the excitement comes a page that reads a simple line "Now the tours are gone." With a picture next to it of the New York today. My daughter stopped me, "Why are the tours gone?" She asked. I suddenly thought to myself What was I thinking choosing this book, what is the right answer? I don't have a long term plan of minimizing the truth about things, such as 9/11, war, terrorism, and death. But in the same way a question like "Where do babies come from?" doesn't warrant a full explanation on the heels of one's fifth birthday - I felt compelled to figure out any easy answer. "They're gone now," I said. This was not, enough. "Why?" she pressed. "They were destroyed," I said. "There was a day not too long ago and they were destroyed, both of them at the same time." I figured giving more information that was also vague would be enough. And in this case it was. We turned the page, finished the book and the conversation was done. That said, it left me with a feeling that there was some recent history that probably warranted some explaining at some point, and I wasn't sure when that would happen. There are certain parts of history that are complex, in fact a lot. Parts that aren't for explaining to young children - whether they be things like genocide, slavery, or even war for that matter. I think I can make it a little while before I have to explain something like the two million lives lost in the genocides during the Khmer Rogue in Cambodia. Yet, I'm not sure at what age discussions about the 9/11 attacks will be a conversation at our dinner table. Will this be something that comes up in school? 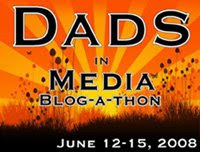 Will we as parents address it with her at another time? It's hard to know when it's appropriate. It's hard to talk about evil, pain, and death. We could have discussed it today when we read The Man Who Walked Between The Towers but the timing didn't seem right. She was wanting to understand the plot point. She knew it was a real story, but to her the towers being gone seemed out of the blue in the context of the story. And I suppose, that in itself that to is part of the story. But today was not the day. Recently I was watching some movie credits and thought, what if everything around us was as self-congratulating as movie credits. So many people get credits. Sure actors, directors, writers, and the people who provided the money to make it all happen. The camera men get credit, so do their assistants, and those who handle the lights, and buy props. In the name of art, I can understand a lot of this. But they also credit accountants, caterers, and the list goes on and on and on. ...And on and on and on some more. 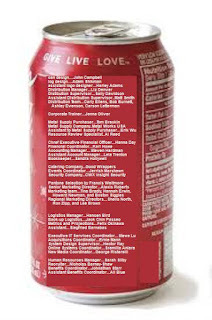 In fact, film credits begin to look like a corporate organization chart. And I wonder with every company's organization chart, titles included was included on every product. Obviously the font would have to be incredibly small on some products. With if every accountant received credit on the products they made...and what if security company's got the credit for providing security on every product. It's ridiculous, but it's an amusing thought. I don't think there's any hope in film credits getting any shorter, and really I have no reason to petition or argue that they should be. But man...some films have a lot of credits...long enough to play a handful of songs and I can't really think of a single other industry that puts so much effort into patting itself on the back this way. The film is The Wolf of Wall Street. The film is directed by Martin Scorsese with a debut feature film screenplay written by Terence Winter (Sopranos producer/writer, Boardwalk Empire producer/writer/creator). The film is based on the memoir The Wolf of Wall Street by Jordan Belfort. Jordan Belfort was born July 9, 1962 in Queen, New York. He was the son of Jewish parents, Leah and Max Belfort, who were both accounts. Belfort founded Stratton Oakmont, an over the counter brokerage fund in the late 1980s. As an over the counter brokerage, the firm sold outside of the market. The firm was responsible for 35 initial public offerings, including Steven Madden Ltd.
Jordan Stratton became very wealthy and developed a large and aggressive firm with over a thousand stockbrokers. During this time, he is also characterized as living a party lifestyle that included an addition to Methaqualone (brand name: Quaalude), a central nervous system depressant. 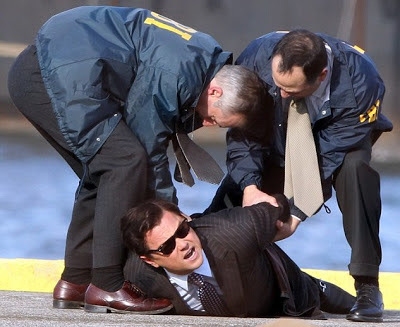 Jordan Belfort made the news in 1997 when his luxury yacht crashed off the coast of Sardinia near Italy, having gone out against the advise of his captain and requiring being rescued by the Italian Special Forces. In 1998, Jordan Belfort would be indited for money laundering firm came under suspicion for some of it's practices and would be charged with a pump and dump scheme in which stocks were bought at one price and then false information was spread to falsely inflate the price prior and the firm would sell the stock prior to it falling back down to it's previous levels. Belfort was put in prison for a scheme that reportedly lost investor $200 million. Belfort was ordered to return $100 million of the stolen funds to stock brokers. This scheme inspired the 2000 film Boiler Room. Upon release from jail Jordan has published two memoirs The Wolf of Wall Street and Catching the Wolf of Wall Street. The film tells the story of Jordan Belfort with a strong cast and crew. In addition to DiCaprio playing the lead role, the film also features Jonah Hill, Matthew McConaughey, Kyle Chandler, Jon Favreau and Jean Dujardin. Will Leonardo DiCaprio's portrayal of a Wall Street Master Heister receive awards attention, and maybe even an Oscar nomination (or win) for this Reel (Real) Person? Before our third child came, I am embarrassed to admit it, but my wife and I spent some decent time watching a couple seasons of the TV show 7th Heaven. 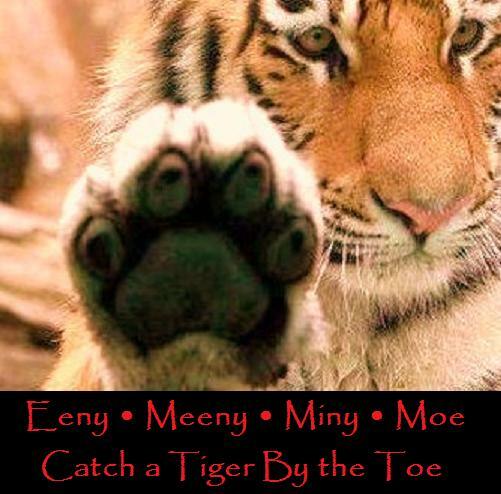 The Camden family stories resolve in the style of Leave It To Beaver and the fuzzy simplicity of a seven kid family is sometimes a little saccharine. But one of the family principles relates to the giving of gifts. It's one of the Christmas episodes, I believe, and the family draws names for giving gifts and each person's gift they give for Christmas is not something that they buy at the store. Instead, the rule is that the gift has to be something that you already own, make or do. For the past couple years our daughter, Linden (at the age of three and then four), has wanted to give a gift to her younger brother,Shepherd. In Camden family-fashion we encouraged her to give him something she already owned, make something or do something. She has opted the past two years to give him something she already has - always thoughtful to consider what he might truly like. This past Christmas, our daughter wanted to give a gift for her brother his favorite train from her Thomas the Train set. She gave him Gordon. Not only was he so excited to receive Gordon, she fully embraced the transfer of ownership. She would ask him if she could play with it, and she regularly checked in with him to see if he was enjoying the train. In the snowy spring Gordon took a trip outside. Gordon stopped working in a way that a change of batteries could not repair. Gordon was kaput. Shepherd still played with Gordon all the time, he just couldn't chug along the track. Linden was sad that the train she gave no longer worked. It was her gift to him and it was sad to her to see him not being able to enjoy it for all of it's potential ability. Months after it's end, she came up with a plan. It was soon going to be her birthday and she thought it would be nice for him to get a present. She knew she would be getting many gifts from her family and birthday party, that she wanted to give him a gift as well. It's not our practice to buy gifts for our other kids when it is not their birthday. We think it's good for our children to let it be someone else's special time. Yet, it was refreshing to see this attitude of love and giving, and didn't want to stifle her generosity. Having collected a modest amount of money in her piggy bank over the years (whether getting coins from her grandparents, taking coins from our end tables, or getting a dollar here or there from who knows where), she wanted to buy her brother a new Gordon train to replace the one he had broke earlier in the year. When she had shared this desire with her grandfather weeks previously he had decided to supplement her operation and passed some one dollar bills to her. He did this on a few occasions. The day between her real birthday and birthday party we went on the hunt. Shepherd joined Linden and I loaded up, Linden had stocked up a snap wallet with bills and coins. So the adventure began. The Thomas The Train market is flooded with way too many trains. It's not like there is a dozen different trains, there are dozens upon dozen. In addition to there being so many different trains, there are also different types of track with their own train types. We have the Trackmaster series, the trains have batteries and move along a plastic track. There is also a wooden series, a mini "take and carry" series, and probably a few more. We started our adventure at Toys R' Us. At Toys R' Us, Thomas The Train had quite the shelf space allocated but the shelves stock was thin, picked over, and consisted primarily of trains that neither of the kids had heard of or had much interest in. The probably had 20 Dart trains (a character who neither of the kids were sure they had seen before), and a lot of Diesel 10 trains. Diesel 10 is a mean train on the island who takes scrap metal and old trains to the smelter works. This was not what Linden or Shepherd were interested in. I had anticipated our trip to be a one stop shop adventure, but with only a choice of Dart and Diesel 10 we took our journey to Target. Target had a smaller shelf space allotted for trains, but far more options. Unfortunately, most of the trains they had were ones already a part of our collection. In addition, they also had many trains from the feature-length movie Thomas & Friends: King of the Railway. There were many Stephen, Caitlyn, and Connor trains. All three of these trains looked very fun, but since King of the Railway (we found out later in the evening when did a little research) was not going to be out until September this wasn't really a substitute for the broken Gordon. Although, Linden seriously considered purchasing Connor. There's a teenage boy at our church named Connor she really likes and Connor the train had passenger cars, and nice pale teal color she liked. We didn't buy at train at Target, but Shepherd had a surprise blow-out diaper and since the adventure was continuing and I didn't have a diaper bag I did buy a box of diapers and a new pair of shorts for Shepherd. Hooray surprise trip to the family bathroom. We were Walmart bound and I told the kids it was the last stop. I hate going to Walmart. I knew I could find Gordon the train online, and had I been buying it myself would have been prone to start and end my shopping online. But online shopping didn't give Linden the shopping experience she was looking for. Additionally, I had no problem with her giving her money to a person at a checkout register, but the experience would be lost if I put on my credit card and she gave me the money. At Walmart, after we played with some large Superman toys in a center display aisle, we found the mismatched and unorganized Thomas The Train section. Far less appealing in it's presentation than Target and Toys R Us. Yet, in the midst of all it's mismatched stacking the options were wide. There were no Darts, Diesel 10s, or Connors. Instead they just had a wide variety of the trains the kids liked. This wasn't the leftovers and it wasn't the next big thing. If Walmart was ever redemptive it was now. Not only did they have Gordon they had two options. They had the standard Trackmaster Gordon (at a price that was lower than Target or Toys R Us would have sold it for), and a Talking Trackmaster Gordon that was a little over four dollars more. Linden and I discussed the different prices, and she was interested in taking the opportunity to not just get a working Gordon, but to upgrade her previous gift with putting extra money into getting a Talking Gordon. She gave her money to the person at the checkout register without complaint. Her worry was not giving up the money, but worry that she might not have enough. She did have enough. It is clear from the experience she has a concept of giving, but her money concept is weak. She was very excited to get 8 cents change back. She replied back "Does that mean I get to spend this money, again." She also observed that her coin purse was much lighter. There were times over her birthday week that you could tell the attention and gifts had made her spoiled and in need of a temporary "birthday detox." But in this moment, she was absolutely precious. There are few times when we are more beautiful than when we truly give from our hearts. I was proud of Linden. Shepherd's just barely two and didn't fully realize the thoughtfulness and generosity of his sister. But it was a true joy to drive them back home while the pushed the "Talking Gordon button" and repeated lines like "Oh, the indignity." The film is The Monument's Men. George Clooney directs with a screenplay he and Grant Heslov (Argo; The Ides of March; Good Night, and Good Luck) have adapted from the non-fiction book Robert M. Edsel's The Monuments Men: Allied Heroes, Nazi Thieves, and the Greatest Treasure Hunt in History. James Rorimer was born in 1905 in Cleveland, Ohio. Upon graduating from Harvard in Paul Sach's museum course in 1927 he was a rising museum superstar, quickly getting a job at the Metropolitan Museum of Art (the Met) where he became the Assistant Curator by 1929, and Associate Curator in 1932. He became an expert in Medieval Art, he planned and developed the popular Medieval museum the Cloisters which opened in 1938. He was also a pioneer in using radiography to examine artwork. Rorimer joined the Army infantry in 1943, and when American and British forces identified the strategy and importance behind preserving cultural artifacts during the world, the MFAA (Monuments, Fine Arts, and Archive) unit was formed. Rorimer was one of the first, recommended by his previous professor Paul Sachs. Rorimer began his role as part of the MFAA inspecting monuments in Normandy, he was then moved within France being assigned to the Sienne section of Paris. During this time he identified a Nazi art looting operation. In the last months of the war Rorimer found himself in Germany as part of the Seventh Army where he discovered vast amounts of looted art including the castle Neuschwanstein and Heilbronn mines. In 1950, he published a book about his experience as a Monuments Men called Survival: The Salvage and Protection of Art in War. He also returned to working at the Met after WWII, He was the director of the Cloisters. By 1955 Rorimer was appointed Director of the Metropolitan Museum of Art where he successfully served as director until he died of a heart attack in his sleep in 1966. The film The Monuments Men tell the story of Rorimer and the other monument men in the final years of WWII. 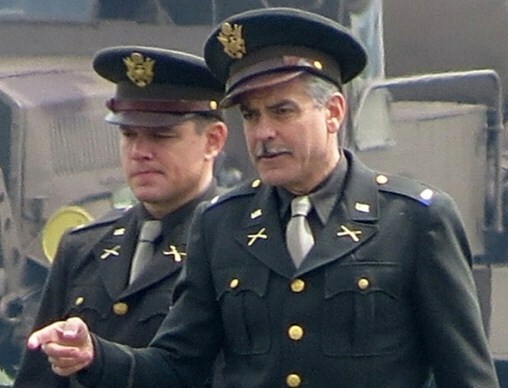 In addition to Matt Damon playing the role of James Rorimer, the film also co-stars George Clooney as George Stout, another one of the Monuments Men. Other stars include John Goodman, Cate Blanchett, Hugh Bonneville, Jean Dujardin and Bob Balaban. It's a strong cast and crew, a unique story, and a war that both Hollywood and film-goers love to see explored in film. Matt Damon frequently takes on biographical roles. Will Matt Damon's portrayal of a unique World War II hero receive awards attention, and maybe even an Oscar nomination (or win) for this Reel (Real) Person? Update: The Character's name in the film was changed to James Granger after this post was initially written. George Stout was born in Winterest, Iowa in 1897. Part of blue collar family he enlisted in the army and served in WWI. Following the war he studied art at the University of Iowa. Finding little success in a career post college he eventually found himself in 1926 with his pregnant wife Margie attending graduate school at Harvard with a minimal stipend. In 1928 Stout joined the art conservation department at the Fogg Art Museum as a graduate assistant. During this time he made the notable contribution of using an old card cataglogue to begin scientifically examining the impact of paint and various chemicals over time. Stout and the department chemist John Gettens pioneered three types of important art conservation branches common today: rudiments, degradation, and reparation. When WWII broke out Stout became an active voice for conservation of great art during the very destructive war in Europe. Ignored, he eventually enlisted himself in the Navy in 1943 where he had the job of testing paint to be used as camouflage on military aircraft. Supreme Court Justice Owen Roberts established the Roberts Commission under President Franklin D. Roosevelt's backing. The Roberts Commission took on Stout's charge that overseas art and cultural artifacts should be preserved during the war efforts, largely in part as a matter of military strategy. Stout became one of the first members appointed to the MFAA (Monuments, Fine Arts, and Archive) unit, of which he would earn the rank of Lieutenant Commander, a group of 15 men (8 Americans, 7 British...of the 15, 8 would be in the field). The monument men, including Stout were involved in many dangerous and operationally challenging task, including discovering stored art in booby-trapped caves and mines, particularly Merker's Mine which was discovered in the spring of 1945. Stout departed Europe in July of 1945, and months later would be sent to Japan for similar work, where he remained until mid-1946. After the war, Stout returned to Harvard's Fogg Art Museum until soon after in 1947 he became the director of the Worchester Art Museum in Worchester, Massachusetts. In 1955 Stout became the director of the Isabella Stewart Gardner Museum in Boston, Massachusetts where he worked until 1970. Stout died in 1978. The film The Monuments Men tell the story of Stout and the other monument men in the final years of WWII. 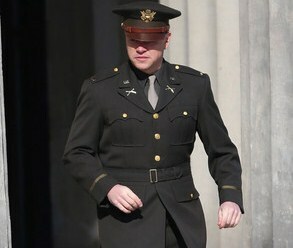 In addition to George Clooney playing the role of George Stout, the film also co-stars Matt Damon as James Rorimer, another one of the Monument Men, the young curator of the Metropolitan Museum. Will George Clooney's portrayal of a unique World War II hero receive awards attention, and maybe even an Oscar nomination (or win) for this Reel (Real) Person? Update: The character's name was updated to Frank Stokes after this post was initially written.